What is it? 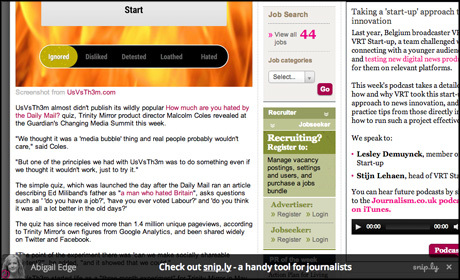 Link shortener which allows allows you to embed a message into any articles you share. How is it of use to journalists? Snip.ly is a simple free tool which allows you to embed messages of up to 80 characters to any article you link to on the web. Simply enter the URL of the page you want to link to, add your message, and Snip.ly will generate a link which you can share direct to Twitter or Facebook. When the link is opened, your message will appear in a band at the bottom of the page along with your name and Twitter avatar. If you want to change this message at any time, Snip.ly stores a list of all the web pages you have "snipped" so all you need to do is navigate to the "edit message" button below your chosen link. As well as being a handy tool for shortening links, Snip.ly would be useful to journalists who want to add an opinion or comment to any links they share beyond what they may have posted on Twitter or other social networks. Because the embedded message includes your name and Twitter avatar, with a link back to your Twitter profile, Snipl.ly also offers a good way to promote yourself, especially around a particular topic or beat. If another user re-posts your link without retweeting or otherwise mentioning you, Snipl.ly also means you still have a visible credit as the original source of that article. Snipl.ly also includes basic analytics so you can see how many clicks your link has had, as well as a geographical map showing where in the world of those interactions are from. In addition, you can also see how many "engagements" (clicks on your embedded message) you have had. There is a Snip.ly Chrome extension which also works with Buffer and Hootsuite. Further plans for development include the ability to embed custom links.